Sicily is the largest island in the Mediterranean Sea and an autonomous region of Italy. This beautiful iland with its varied and unique nature is a popular holiday destination. Residence Royale selected the finest villas and vacation homes on the island for you. Look at our luxury villa rentals on Sicily and choose one of our wonderful villas for a fantastic holiday on Sicily! 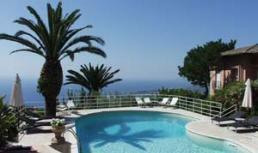 This luxury villa for 9 is for rent in Taormina, only 5 min.on foot from the old town centre. Villa Mare has 5 bedrooms, 5 bathrooms and airconditioning. It is surrounded by a large garden with private pool and stunning sea views! This extraordinary villa for 10 is for rent in Taormina and enjoys spectacular views of the Mediterranean Sea all the way to the summit of the Etna. Villa Greco has 5 bedrooms, 4 bathrooms, airconditioning and a private pool. A magnificent villa on an unique location! This lovely villa for 6 is for rent on the bay of Mazarro, only 200 mtr. from the beach and 400 mtr. fom the cable car to down-town Taormina.Villa Annette comprises 3 bedrooms, 2 bathrooms, ADSL internet, airconditioning and a large jacuzzi with hot and cold water. A beautiful villa on a fantastic location! This luxury villa for 12 is for rent in the hills above Acireale on the east coast of Sicily with beautiful views of the Mediterranean. Located 15 km from Catania. Villa Acro has 6 bedrooms, 5 bathrooms, airconditioning, internet and a private pool. A magnificent villa with splendid sea views! This lovely vacation home for 8 is for rent in Carruba, near the attractive town Riposto and only 1 km. from the beach. The villa is located 20 km from Catania and Taormina. Vacation home Carruba has 4 bedrooms, 4 bathrooms, airconditioning and a private pool. 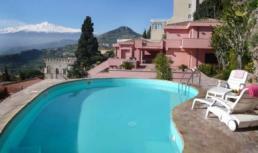 A wonderful vacation home with a beautiful view of the Mediterranean and the Etna!